How are you all? Good I hope? As I have mentioned before since being off for 6 months I certainly lost my mojo, this was one of those bad days that ended with me thinking I am good! I have very low self esteem in many areas of my life but every now and then I will make something and think yes! Hell yes! I have got it! We all deserve that and this project is it. All my layers are 1cm smaller and narrower than the previous. 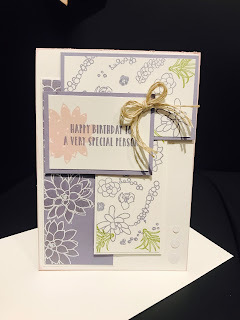 I put each layer where I thought look good, making sure my heat embossing was always the focal point. I have included at the end of this post the cards my ladies made in their class. They done a great job! Some of them had never seen heat embossing let alone done it themselves! The white flowers on the wisteria wonder are heat embossed with the white powder and coloured in with the clear wink of Stella to really make them pop! 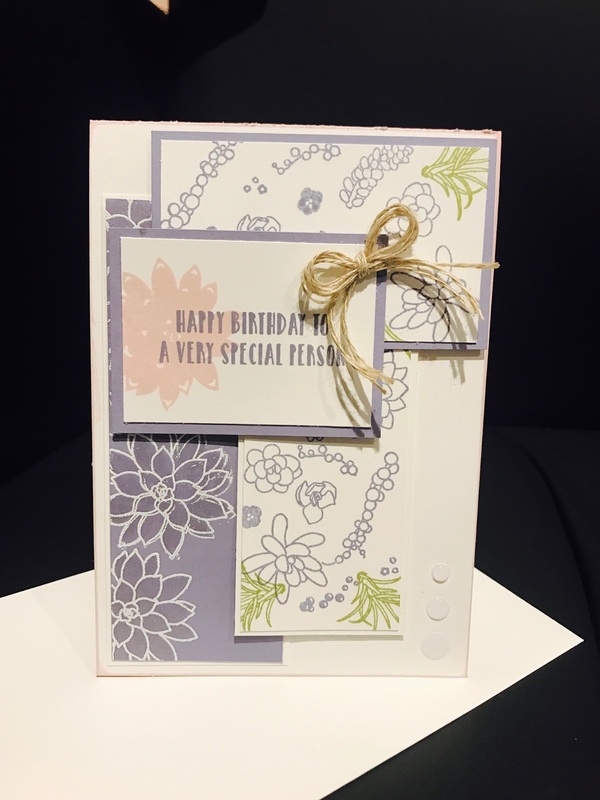 They are the focal point in this card. I wrapped some linen thread around my fingers to get a few layers so my bow would be fuller. The layers are just all stuck however I felt was pleasing to the eye. I also added one of each of the white enamel dots sizes. Just to add some bling!